SANDGATE, Vt. (AP) — Once a side venture that helped farmers pay their taxes, Vermont maple syrup is becoming big business, with corporations buying up thousands of acres of trees as they bank in part on a rise in demand for alternative natural sweeteners. In a state that often eschews outsiders as "flatlanders" and is fiercely protective of its image and branding, it's perhaps surprising that smaller maple syrup operators don't seem concerned about the big newcomers. That's because demand continues to rise, they said. "It's a natural product, it's a little healthier than some of the natural sweeteners, and people like that," said Henry Marckres, the Vermont Agency of Agriculture's maple specialist. "Also local, people like to buy local and that is a locally produced product for the most part." In the past year, Crown Maple, which started making maple syrup in 2011 on 800 acres in Dutchess County, New York, bought 4,500 acres to tap in southern Vermont and is searching for more land even as the state's sugaring season gets into full swing this week. In northern Vermont, Sweetree, an operation backed by a Connecticut capital management firm, bought 7,000 acres and is leasing about 8,000 more with plans to become the largest producer of maple in North America, selling syrup, maple-sweetened beverages and other products. 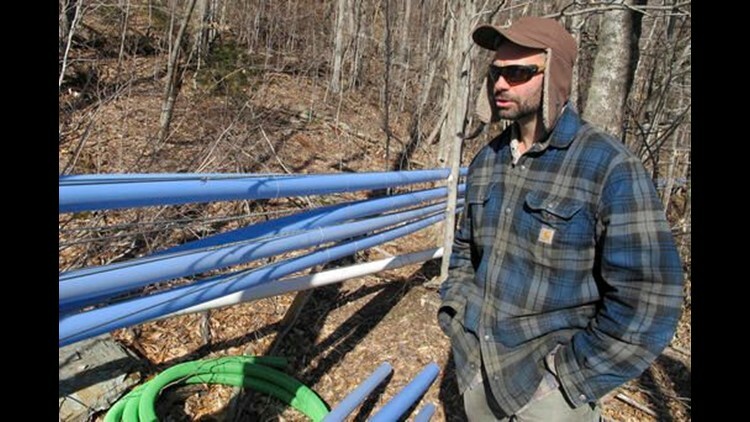 A large tract of land was also purchased near Killington for a planned maple operation, and a New England family bought a small parcel in Marshfield and is looking for more land with plans for the limited liability corporation it set up — Adirondack Management LLC — to develop large-scale, sustainable investments in the maple syrup sector. "There are many benefits of investing in maple syrup; right now the demand for pure maple syrup is rapidly growing since it is the all-natural, local, healthiest, and best-tasting sweetener in the Northeast," said Colin Christie, of Adirondack Management, by email. Over the past 15 years, maple production in the 10 biggest producing states has nearly tripled, although yields vary year to year, according to the U.S. Department of Agriculture. Vermont, the country's largest producer, made 1.3 million gallons of syrup last year, compared with an estimated 500,000 gallons in 2008. Demand for alternative sweeteners has risen as consumers seek products they perceive as more healthful than processed cane sugar or artificial sweeteners. "People are coming to the realization that local and sustainable is better than artificial" or heavily processed, said Peg Checchi, a chef instructor and chairwoman of online education for the New England Culinary Institute. Studies at the University of Rhode Island found that the compounds in maple syrup are similar to those in green tea, berries, red wine and flax, said Navrinda Seeram, an associate professor at the school's department of biomedical and pharmaceutical sciences. But there's no direct scientific evidence that maple syrup is healthier than white sugar, according to the Cornell Sugar Maple Research & Extension program. "It doesn't mean that we want to tell people to eat more maple syrup or eat large quantities of maple syrup," Seeram said. "It's still a sugar. You know, the last thing we want is for folks who have Type 2 diabetes to be consuming more sugar." Crown Maple is shipping its sap from Vermont to New York, where it's processed into syrup. The company lists recipes on its website for maple lemonade, maple bourbon-glazed short ribs, maple coconut chips and maple old-fashioneds, showing the possibilities of the richly flavored sweetener, said Tyge Rugenstein, chief operating officer. "I think a lot of chefs are starting to realize that," Rugenstein said. "And that's really helping, I think, the growth of the industry as people realize it's a very versatile natural sweetener."